In 1844 at the age of 25, she married John Tubman, a free African American who did not share her dream. Since she was a slave, she knew there could be a chance that she could be sold and her marriage would be split apart. Harriet dreamed of traveling north. There, she would be free and would not have to worry about having her marriage split up by the slave trade. But, John did not want her to go north. He said he was fine where he was and that there was no reason for moving north. She said she would go by herself. He replied with questions like "When it's nighttime, how will you know which way is north?" and "What will you eat?" He told her that if she ran off, he would tell her master. She did not believe him until she saw his face and then she knew he meant it. Her goal to achieve freedom was too large for her to give up though. So in 1849 she left her husband and escaped to Philadelphia in 1849. In or around 1844, she married a free black man named John Tubman. Although little is known about him or their time together, the union was complicated due to her slave status. Since the mother's status dictated that of children, any children born to Harriet and John would be enslaved. Such blended marriages – free people marrying enslaved people – were not uncommon on the Eastern Shore of Maryland, where half the black population was free. Most African American families had both free and enslaved members. Larson suggests that they might have planned to buy Tubman's freedom. Tubman changed her name from Araminta to Harriet soon after her marriage, though the exact timing is unclear. Larson suggests this happened right after the wedding, and Clinton suggests that it coincided with Tubman's plans to escape from slavery. She adopted her mother's name, possibly as part of a religious conversion, or possibly to honor another relative. Normally, female slaves at a young age were forced to marry a mate chosen by their masters. Because of her injury, Harriet was spared this tradition. However, Harriet, now in her twenties was getting too old to remain unmarried. Having worked and earned her own money, she attracted a free black man named John Tubman, who also worked odd jobs at various plantations. 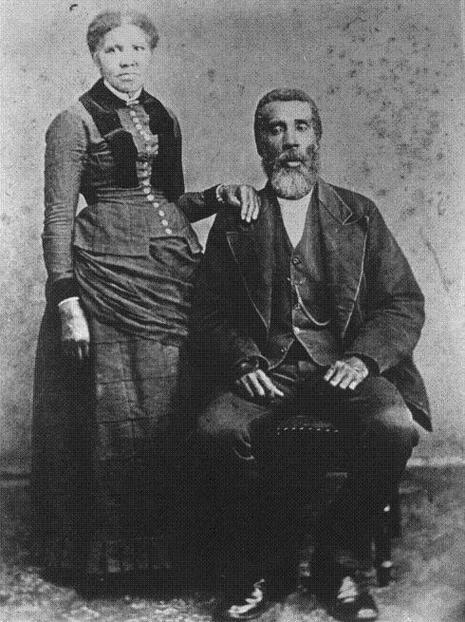 Although marrying a free man was quite unusual for a slave, they permitted Harriet and John to marry. Although forced to do so by her mother, Harriet in 1844, at the age of twenty-four, married John Tubman. Having married a free man, Harriet thought of nothing but to one day be free herself. Interestingly, they should never have enslaved Harriet. One day, determined to trace her roots, she hired a lawyer at the cost of five dollars to trace the will of her mother's first master. In doing so, a will was found that gave her mother, Harriet Green, to an heir named Mary Patterson. The will provided that Ms. Green was to serve Mary Patterson until Patterson was forty-five years old. However, Patterson died before reaching this age, and was unmarried. Because there was no provision in the will concerning Harriet Green upon Patterson's death, she was therefore free. Unfortunately, no one told Ms. Green of this right, consequently she and her children remained enslaved. Harriet Tubman, now armed with this information was now more than ever determined to be free.